The idea behind Head Start is fairly simple: Preschool education for the nation's most disadvantaged kids. The program turns 50 next year. There are reams of documentation celebrating its success. 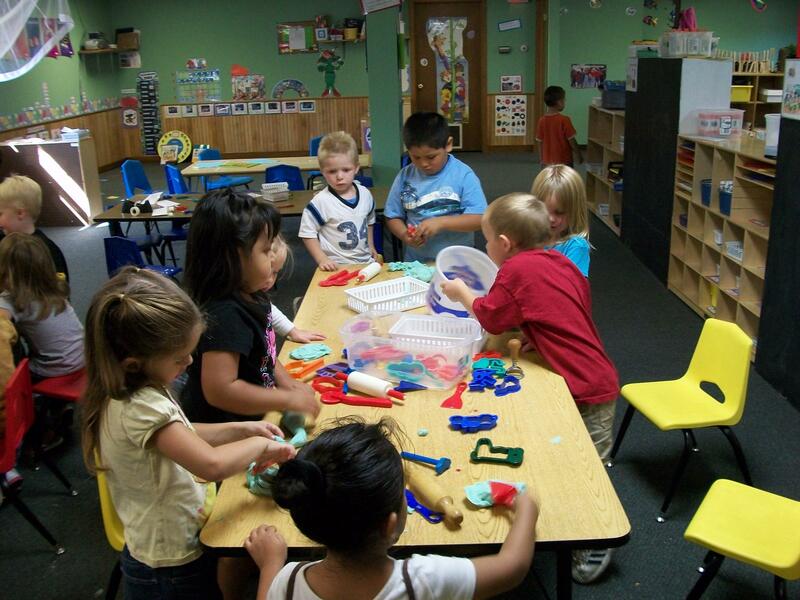 Preschoolers in a Head Start program for early childhood development. Detroit Public Schools lost their opportunity for Head Start next year. The district says they will make up the difference with other sources of funding. So, why did Detroit Public Schools, where four of every five children are on school lunch programs, not finish its Head Start application for the upcoming school year? Why are some 900 kids suddenly not getting this "tried and true" educational kick-start? Bridge Magazine investigated this seemingly large gaffe. To some people, it's incompetence – a charge leveled against the school district before. Even district officials admit the error. But to others, there is something more sinister at play. Here's a little background. The Detroit school district has been under an emergency manager since 2009. The latest DPS manager, Jack Martin, was appointed by Gov. Snyder and started about a year ago. Martin was the former CFO of the city of Detroit. Under the emergency manager, the district's elected Board of Education has limited power. In solvent, or less financially stressed districts, boards determine everything from spending to curriculum changes. Five school districts are under emergency management: Detroit, Highland Park, Pontiac, Benton Harbor and Muskegon Heights. All are in cities which are or have been under emergency management, except Muskegon Heights. All are cities with high levels of poverty. At the time DPS was placed under an EM, its projected deficit was more than $118 million. Its superintendent had been fired. The board objected. The first EM investigated spending and suggested that the district's deficit was closer to $306 million. Outside the school system, children can access Head Start through community centers. But the children who get Head Start from the school district are taught by certified teachers, while programs at community centers may not be. So, under the emergency manager, the Head Start program, which is funded through a specific pot of federal dollars, won't continue. DPS spokesman Steve Wasko says the district is expanding preschool options. To do so, he told State of Opportunity, DPS will use state dollars from the state's Great Start program and federal dollars from the Title I program. Wasko says the error happened as the district applied for the funds directly for the first time. For years, he says, another agency had managed the applications and fund disbursement. He stressed that teachers will remain employed and children will get the same curriculum in preschool, regardless of the funding source. "We will have more pre-K next year than we did last year," Wasko says, referring to expansion under Great Start and Title I funding. But when money gets shifted from one place to another, say people upset about the filing error, someone is losing out. The value of the Head Start grant was about $4.3 million. And under Great Start, students who previously got home visits, health care consults and even English classes under Head Start, won't. Detroit has more than 3,000 children getting early childhood education through some program. LaMar Lemmons, president of the Detroit Public Schools Board of Education, says he was appalled at the snafu. An outspoken critic of the emergency manager, Lemmons says the blame falls squarely on Governor Snyder's shoulders. He says the error might have been deliberate and further proof that the emergency manager doesn't have Detroit school children's best interests at heart. As the 2013-2014 school year comes to an end, parents will have the summer to consider whether they should stay with DPS, or go to a community center to specifically request Head Start services. Does this situation affect you? Do you have an upcoming preschooler in Detroit or somewhere else? State of Opportunity would love to hear from you. Email meghas@umich.edu.